We nipped along to Central Saint Martins yesterday to catch a free lunchtime talk by the utterly wonderful Brian Bolland, one of the finest comic book artists in the world, and officially a Very Nice Guy. He created the sublime The Killing Joke (above, written by Alan Moore, the guy behind Watchmen , V for Vendetta and a host of other classics), as well as being one of the principal artists on 2000AD, particularly on Judge Dredd, and doing extensive work for DC on Animal Man, Wonder Woman, The Green Lantern and The Invisibles. Bolland was talking about work from right across his career, and showed early draft work as well as finished pieces. He did a postgrad graphics course at Central Saint Martins in 1974, having previously studied at Leicester School of Art and Norwich School of Art; and had spent his early career working out of his room at 110 Southampton Row, just yards from where the talk was taking place. He's best known for his beautifully controlled pen and ink work, though he now works entirely in Photoshop, using a Wacom tablet and pen. Check out his site for some really in-depth (and entertaining) step by step tutorials showing his working process, as well as a huge gallery of work. Bolland stressed the importance of life drawing, having spent at least one day a week on it at college. It was sobering to hear the silence when he asked who in the room (which largely consisted of illustration students) was doing life drawing. You can see more of his work in the book The Art of Brian Bolland . Lovely stuff. Tom Gauld is one of our favourite writers / illustrators, and his latest book, The Gigantic Robot, has just been launched. He describes it as "a wry fable concerning the production of an impressive secret weapon whose promise goes unfulfilled". You can pick it up from the comic store at Cabanon Press (the site he shares with the lovely Simone Lia, who also has her own site). And check out some more Gigantic Robot production shots. 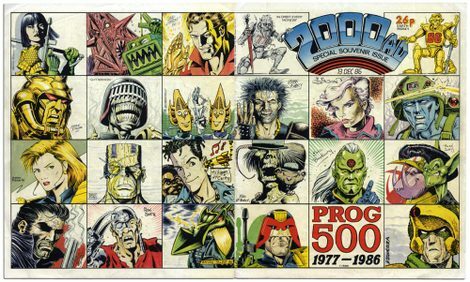 If you were a British teenager in the early 80's, and into comics, then you were almost certainly a fan of 2000AD. We still have fond memories of tearing down to the local newsagent on a Saturday morning to pick up the latest weekly issue. It cost 24p "in Earth money" back in 1985 - amazingly it's still going strong, though a copy will set you back £1.75 now. BBC4 is currently running a great series all about the British comics industry, Comics Britannia. We missed the first episode, but caught the middle one (which is repeated on Wednesday 19 at 11.30pm), and are totally looking forward to the third and final one, which deals with 2000AD, Viz, and the growth of the graphic novel. You can catch it on Monday 24 at 10.30pm. There's also a season of related programmes to sink your teeth into. Rooting around amongst our old comic collection (see the post below), we also stumbled on this copy of 2000AD, which was the British comic we (and how many other UK graphic designers?) grew up on more than any other. We can't quite believe it's twenty years old already, nor that the title is celebrating its thirtieth birthday this year. Judge Hershey, Torquemada and Ro Jaws, Dan Dare, Hammerstein (ABC Warriors), Judge Death, Ace Trucking, Slaine, Halo Jones, Rogue Trooper, Judge Anderson, Kano (Bad Company), Sooner or Later, Fink Angel, Tharg, D.R. and Quinch, ?, Mean Machine Angel, Nemesis, Judge Dredd, Johnny Alpha (Strontium Dog). There were some really fantastic stories and artists in 2000AD, and Gorillaz artist (and Designer of the Year) Jamie Hewlett popped up in it for a while on a story called Hewligan's Haircut. Our favourites from way back then were Zenith, Devlin Waugh, Rogue Trooper and Bad Company. Oh, and this place has a good collection of original art from the comic.